Do you ever feel like you’ve had a super busy week but haven’t really gotten any headway? Ever have so many priorities each week you’re not sure which ones to focus on? You start the week feeling pumped and super focused, but then you end the week wondering where all the time went. You feel like your big plans got pushed aside by a million little things that came up and too much of your days were spent doing “busy work”. You feel defeated and stressed. You have a mountain of a goal to climb but it feels like you’re stuck at the bottom going in circles. Or that every step results in you stumbling back down to the bottom. You’re not alone. But there’s a way to overcome this. There’s a way to accomplish your goals step by step and reach that mountain top. It starts by mastering the weekly meeting. Now you may be thinking, “how can a meeting have such an impact?” You probably have meetings all the time. You might even feel like you have too many meetings that are eating up your time and holding you back from accomplishing your goals. Being productive takes thought and planning to make sure you’re focusing your efforts on the things that will have the most impact. It’s taking the time to think about your foot steps to make sure they’re the right ones that will help you climb that mountain. And when you’re managing a team or an entire company, it means making sure everyone is focused on that mountain top and are all taking the right steps behind you. Mastering the weekly meeting is part of implementing the Rockefeller Habits – something we’ve adopted over the last few years. Done correctly, the weekly meeting can keep you on track with reaching your goals. But to do so requires planning, routine, and discipline. Here’s how to master the weekly meeting so you can increase productivity and achieve your company goals. At the beginning of the week, set a time with yourself and a rep from each department – this may mean the manager of each department or the leader of the department if you’re a business of say 5-20 people. Start the meeting on a positive note. Go around the room and discuss the successes from each member or department. What goals did you achieve from last week? Was there a positive comment from a customer? Did you hit a monthly target? Was a large task or project completed? Did you win a new client? You can also share personal successes and good news. Review your list of top priorities and critical numbers. You’ll first want to put some time into planning out your top priorities and the crucial numbers for you to track on a weekly basis. These should be directly tied to your main goal for the quarter or for the year. For example, you may have a goal to increase sales by 10%. What are the top 1-3 things you’ll need to do in order to get there? How do you break those down into weekly things needed to be done? What metrics or gauge will you use to know if you’re on track or behind? Those will be your main priorities and critical numbers that you can track on a weekly basis. Define the metrics of success that you will use to track. For example, total sales revenue for the week, number of leads in the pipeline, number of converted leads within the last week and number of lost opportunities within the last week. This will give you an indication as to where you should focus your efforts. Are you not getting enough leads in the pipeline? Are you not converting enough leads? Each week you’ll want to identify the status of your top priorities. Is it on track? Is it falling behind or at risk of falling behind? Is it in crisis mode and need immediate attention? You can also use these colours to track your critical numbers. Are the numbers on track to reach your target? Are they way below where they should be? By colour-coding the status of your priorities and your critical numbers, you can easily skip through anything on track and just touch on anything that’s a bit behind or needs your attention. The idea is to just discuss anything that needs your attention or is at risk of running behind schedule. When raising a yellow or red, don’t focus on the problem. Ask yourself and your team “what can we do to turn this red or yellow into a green?” The purpose is to identify something that can be actioned to get back on track. Be careful to not get stuck on one topic or you won’t get through the meeting. For this reason, it’s helpful to have a “cop” that’s duty is to make sure the meeting stays on track and on time. If something is in the red and requires further discussion or brainstorming, take it offline or schedule a separate meeting with only those who need to be involved. 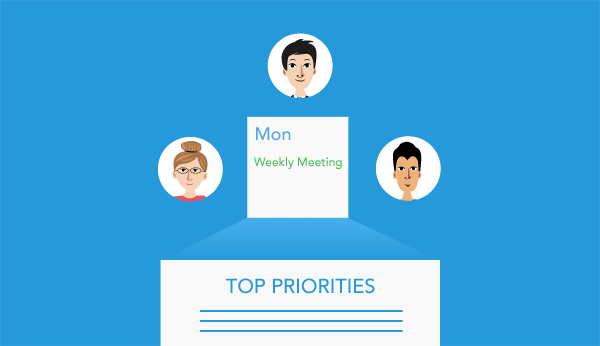 The purpose of the weekly meeting is to make sure you’re on track with your top priorities. Identify anything that needs attention so everyone is aware, and create an action plan so you can get back on track. This helps your company stay focused. You’ll notice that this practice also forces you to say no to things that come up that are less important. After 10 minutes of discussing anything that are holding you back from making progress on your top priorities, move on to the next section. This 10 minutes should be discussing important customer or employee issues. For example, what is the health of your customers? Is there anything that should or could be done to increase it? What is the temperature of your employees? Is there anything you can do to improve it? Are there any issues within team members that needs to be raised? Any customer issues that need immediate attention? You can use metrics such as NPS (Net Promoter Score), CSAT (Customer Satisfaction Score), and ENPS (Employee Net Promoter Score) as indicators of any problems. This is the opportunity to discuss an important issue or big rock that needs attention. Is there one main priority that’s in the red? Now’s the time to raise some ideas of how to get it from red to green. Or perhaps one of the top priorities is a yellow and you need to address how to get it back on track before it becomes a problem. Are there critical numbers or priorities that have been in the red week after week? Do you need more info to find out how to solve this problem? What needs to be done in the long term? What can be done this week, or today? Use this time to brainstorm and problem solve so you’re starting the week with attention on what’s most important. Take the last 5 minutes to identify any actionable items that come up as a result of the discussion. Are there other meetings that need to be scheduled to discuss a problem and brainstorm ideas in more detail? Are there other metrics or data you need to collect before making a decision? Who’s responsible for collecting them and when will you next discuss? Are there new tasks that have come up that need to be assigned as a result of the discussion? Record what needs to be done, by whom, and by when before ending the meeting. Make sure everyone is clear on the next steps. By mastering the weekly meeting, it’s helped us increase productivity by staying more focused on the top priorities that move us forward collectively as a company. It keeps each department on the same page and up to date about what’s going on at a top level without wasting time or getting lost in the weeds. To support your weekly meeting, it’s also good to get into the rhythm of having a daily huddle. This is just a quick 10-15 stand-up where you take turns each stating your victories or successes from the previous day, any daily metrics you track, your top priority for today, and any challenges that need to be raised. Want to improve sales productivity and streamline project management in your small business? 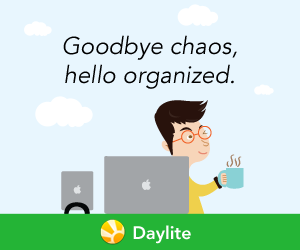 Try Daylite!